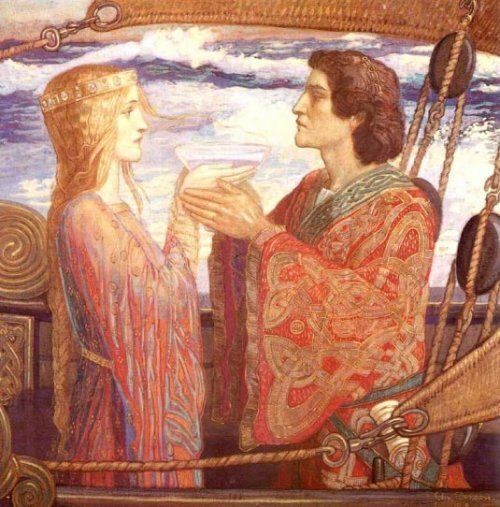 I put a starter-kit of Tristan und Isolde motifs in our ONLINE SPOTLIGHT GUIDE. But I’d also like to use this blog to explore the rich thematic and musical imagery of this opera in a little more detail. Let’s start with the potion, which we began exploring (in terms of the story, in any event) HERE. Musically, we always hear Wagner’s enigmatic “Tristan” chord when they’re referring to the potion. The famous opening of the opera becomes something like a “potion” motif. I’ve always thought Wagner made a strange choice in that last moment, bringing on Brangäne to apologize for drugging the lovers, as it were, at the very end when Tristan and Kurwenal are both dead and Isolde is about to sing her Liebestod. Usually I find myself wanting to yell at Brangäne, “Are you still talking about that? That was Act One!” But I think that’s the point: the opera begins and ends with the potion, the potion is the alpha and the omega and the core of the story of Tristan und Isolde. "Bran" apologizes probably because she has a guilty conscience, even if MJ Wray thinks the love potion and the death potion are one and the same. Wagner wrote the text, not Mary Jane.